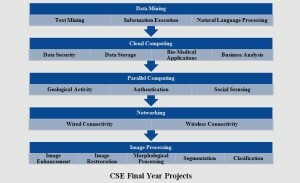 CSE Final Year Projects is a review of computers, components and applications. We develop cse projects mainly with java (or) .Net framework. We possess various domains for computer engineering final year students. Our main aim to develop cse final year projects is to understand and to provide practical, theoretical knowledge about the domain for students. 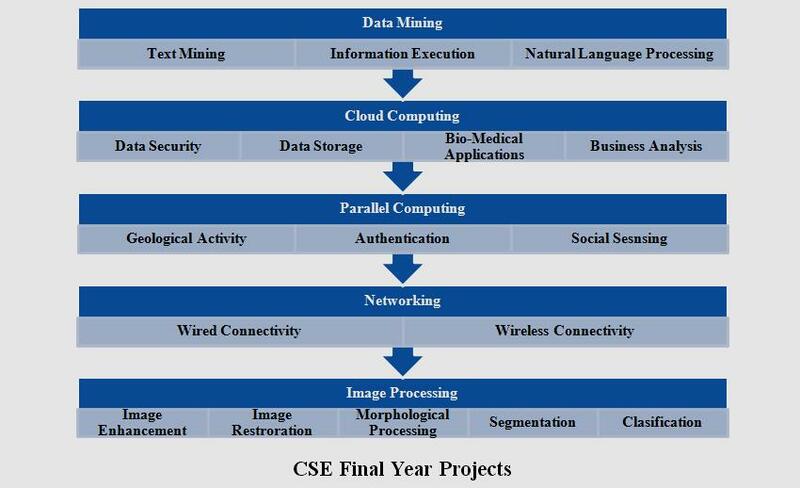 Techniques such as hardware components, type of communication network, data base management system, computer architecture, software development life cycle, digital signal processing are all implemented by us under cse final year projects. We support and develop IEEE standard research papers for computer science students. To retrieve a valid information form database we use data mining. We gather information and store in database are the process performed by data mining. We also implement text mining, information execution process, natural language processing are processed under data mining. Relevant information is gather based on user input is a major challenge in information retrieval process. So it uses index term to calculate frequency for each item. Model such as vector, Boolean and probabilistic model are used for information retrieval process. We implement computing application to write software program for serial communication which execute single instruction at a time. We adopt parallel computing which use multiple resources and to solve issues in serial computing. It used to motivate various systems to measure weather, chemical and nuclear reactions, geological activity, climate, electronic circuits and biological, human genome. Network is an interconnection of computer, terminal, printer and other wireless devices. Physical connection such as twisted pair cable, coaxial cable, and fiber opticable are used by us. For wireless connection we use radio frequency, infrared signals and micro wave signals. Half duplex, full duplex and simplex are used by network system. To manipulate digital image we use image processing. The process involved is processing image information for storage, transmission and increase pictorial value for human interpretation. We support 2D and 3D image. We involve various steps are image enhancement, image restoration, morphological processing, segmentation and image classification. We developed more than 110+ projects in image processing to perform various processes in an efficient way. Tagged Inmate file format (TIFF). Flexible Image Transport System (FITS).